The Master of a ship or Commander of an aircraft must notify the proper authority, before arrival, of the presence of animals or captive birds, and any occurrence of mortality or sickness amongst such animals or birds. If this information is not able to be provided before arrival, notification to the authority must take place immediately on arrival. The proper authority may be a Port Health Authority for a port health district or a Local Authority if no such district has been established. All animals on board ships or aircraft must be securely confined so that they cannot escape or come into contact with any other animal. Animals intended for import must be securely confined and not landed until they are collected by an authorised carrying agent. The system of controls relies primarily on imported animals being accompanied by health certification and being subject to post-import veterinary inspection. There are exceptions to this for some rabies susceptible species under the PETS scheme as detailed in Chapter 3.2. The controls fall into two main categories: those for animals transported from other member states of the European Union and those imported from third (non-EU) countries. Most live animals consigned to the United Kingdom from other Member States must originate from an approved establishment and be accompanied by an official Health Certificate. EC Single Market rules do not require routine public health checks at ports of entry, however, except in the case of registered horses and live fish and shellfish, all importers must notify the Divisional Veterinary Manager (DVM) of their intention to import at least 24 hours in advance of the expected date of arrival. All live animals (with the exception of animals under the PETS scheme) arriving from countries outside the European Union, i.e. Third Countries, must be checked at approved Border Inspection Posts, i.e. those ports equipped with EC approved facilities and personnel. All Rabies susceptible animals entering the United Kingdom are subject to controls to prevent the potential importation of Rabies and certain other animal diseases. Masters of commercial cargo ships and small yachts, boats and pleasure craft arriving in UK ports from foreign ports must report the presence of any animal on board to both the Port Health Authority and UKBA. Rabies susceptible animals imported are subject to 6 months quarantine at the owners’ expense at a Defra approved establishment. These controls are contained in the Rabies (Importation of Dogs, Cats and Other Mammals) Order 1974 (as amended). EU Regulations dealing with the movement of pet animals also covers birds (except certain poultry), ornamental tropical fish, invertebrates (except bees and crustaceans), amphibians and reptiles. The rules for the movement of these species between EU countries, and into the EU, have not yet been set by the European Commission. To bring these animals into the UK they must meet either national import rules or, the general rules for trade in the particular animal species. Many rare or endangered species are subject to additional licensing controls under the European Wildlife Regulations, which implement the Convention on International Trade in Endangered Species (CITES). Further details about these requirements may be obtained from Animal Health www.defra.gov.uk/animalhealth. CITES deals with the illegal importation of endangered wildlife and their products, e.g. red eared terrapins, un-worked ivory, ivory carvings, reptile skin handbags, etc., (not an exhaustive list) and is enforced at sea and airports by UKBA officers. Inland these regulations are enforced by Police Officers and Animal Health’s Wildlife Inspectorate. The Pet Travel Scheme (PETS) is the system which allows pet cats and dogs and more recently rabbits and ferrets from certain countries to enter the UK without quarantine as long as specific rules are complied with. It also means that UK Nationals may, having taken their pets to those countries, bring them back without the need for quarantine. PETS only applies to pet cats and dogs, rabbits and ferrets, including guide dogs (www.guidedogs.org.uk) and hearing dogs and certain other small domestic animals. It is limited to pets coming into the UK from specified countries and territories and generally only operates on specified sea, air and rail routes to England. Pet animals complying with the requirements of PETS may not be imported into the UK on board privately owned aeroplanes or water craft (except from the Republic of Ireland). 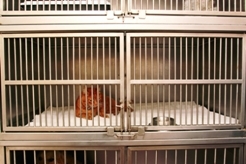 Animals from non-qualifying countries must spend 6 months in quarantine. Before any of the other procedures for pet animals are carried out, your pet must be fitted with a micro-chip so that it can be properly identified. After the micro-chip has been fitted your pet must be vaccinated against Rabies. After your pet has been vaccinated, it must be blood-tested to make sure that the vaccine has given it a satisfactory level of protection against Rabies. If the animal’s blood test is satisfactory, a government-authorised Vet can issue an EU Pet Passport. These Vets are known as Local Veterinary Inspectors (LVIs). A Passport may also be issued to a pet after it has been micro-chipped and vaccinated. For re-entry into the UK the blood test may be carried out in another qualifying country. The Passport will become valid for re-entry into the UK six calendar months after the date when the blood sample was taken and which gave a satisfactory test result. The Pet Passport will remain valid provided the animal’s Rabies booster vaccinations are kept up to date. These must be administered before the valid ‘until date’ in section IV of the Pet Passport. The animal must be treated for ticks and tapeworms between 24-48 hours before being checked-in to travel into the UK. If you are taking your pet on a day-trip abroad, it will need to be treated in the UK between 24 and 48 hours before it is checked in for the return journey. The treatment must be administered by a qualified Veterinary Surgeon. After treatment the Vet must complete sections VI and VII of the animal’s Pet Passport. To bring your ferret into the UK the procedure is the same as outlined above except that ferrets do not require a blood test. A wait of six calendar months is applicable in certain circumstances. Cats and dogs or other rabies susceptible species not covered by the PETS scheme may not land in UK unless an Import Licence has previously been obtained from Defra. As information is liable to change travellers are advised to telephone the PETS Helpline on +44 (0)870 241 1710 or visit the Defra website www.gov.uk/take-pet-abroad for more information on PETS and the latest information on qualifying EU and non-EU (Third) countries and approved routes.